Chinese students will live in a laboratory simulating a lunar-like environment for up to 200 days as Beijing prepares for its long-term goal of putting humans on the moon. Four postgraduate students from the capital's astronautics research university Beihang entered the 160-square-metre (1,720-square-foot) cabin—dubbed the "Yuegong-1", or "Lunar Palace"—on Wednesday, the official Xinhua news agency reported. The volunteers will live in the sealed lab to simulate a long-term, self-contained space mission with no input from the outside world, Xinhua said. Human waste will be treated with a bio-fermentation process, and experimental crops and vegetables grown with the help of food and waste byproducts. The cabin represents the "world's most advanced closed-loop life-support technology so far", state broadcaster CCTV said. 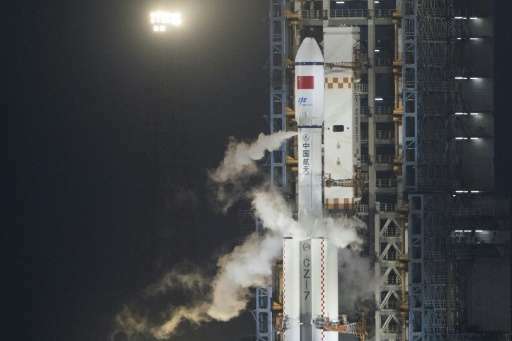 China does not expect to land its first astronauts on the moon for at least another decade, but the project seeks to help the country prepare lunar explorers for longer stays on the surface. Two men and two women entered the lab on Wednesday for an initial stay of 60 days. They will then be relieved by another group of four, who will stay 200 days, before returning for an additional 105. The "Lunar Palace" has two plant cultivation modules and a living cabin: 42 square metres containing four bed cubicles, a common room, a bathroom, a waste-treatment room and a room for raising animals. "I will be in charge of the treatment of solid waste, urine, shredding straw, threshing wheat, processing food and other work," one of the student volunteers told CCTV, adding that other team members would have tasks related to crop growing, health monitoring, and supply inventory. The Lunar Palace is the world's third bioregenerative life-support base, and the first developed in China. It is the only such facility to involve animals and microorganisms as well as plants and humans, its chief designer Liu Hong told CCTV, calling it "the first of its kind." Beijing sees the programme as symbolising the country's progress and a marker of its rising global stature, but so far China has largely replicated activities that the US and Soviet Union pioneered decades ago. Last month, China's first cargo spacecraft, Tianzhou-1, successfully completed docking with an orbiting space lab.